Postpartum depression lasts longer and brings more severe symptoms than "baby blues." (CNN) -- Matthew and his wife were excited about the birth of their daughter in January 2008, and the proud father took a month off of work to spend time with his spouse and child. About six weeks after the baby's birth, Matthew, 35, who asked not to have his real name used, found himself wanting to sleep all the time. He stopped finding joy in his hobbies and got to the point that he didn't want to go out to dinner with his wife anymore. Having spent six years in the Army, he had always prided himself on mental toughness. But with a newborn, he found himself daydreaming about running away and contemplating suicide. "People in history would think they were possessed by a demon -- that's kind of what it felt like," the California-based father said. "I didn't have control over it." Despite a year of therapy, Matthew never knew what to call these intense feelings until he started hearing women's stories of postpartum depression. In fact, postpartum depression in new fathers is a real phenomenon, and is more common than previously thought, according to a study published Tuesday in the Journal of the American Medical Association. 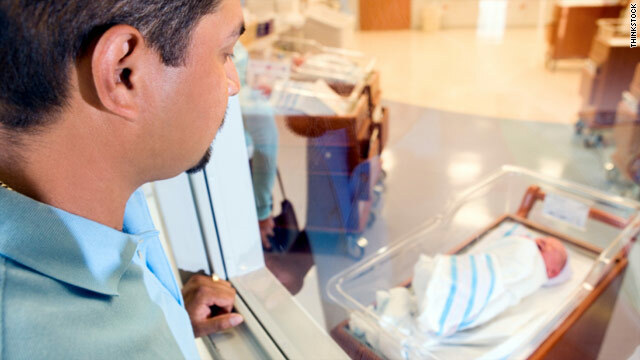 About 10 percent of men have prenatal and postpartum depression, the study found; previous research had estimated 5 percent, said lead author James Paulson of the department of pediatrics at Eastern Virginia Medical School. "It's not screened for and caught enough in women, and I would say in practice it's [depression in new fathers] virtually unknown," Paulson said. "Most clinicians and most moms and dads aren't aware that there's an increased risk of depression for fathers." Depression in fathers has potential negative implications for the family, and for the child's development and behavioral and emotional health, he said. Paulson's study also found that fathers' depression tended to have an association with mothers' depression -- so when moms were more depressed, so were dads. But more research is needed to determine how the two are related, as one parent's moods have not been proven to cause the other's. Researchers did an analysis of 43 studies on documented depression in fathers between the first trimester and the first year after childbirth between January 1980 and October 2009. This yielded data on more than 28,000 participants. Studies found that as many as about 25 percent of new dads had depression in the three to six months after childbirth. Although his analysis did not examine causes, Paulson said he speculates that leaves of absence from work usually expire around three months, and parents need to renegotiate how to care for the infant. Sleep schedules also may shuffle during this time, he said. Rates of fathers' depression were higher in the United States, at around 14 percent, than abroad, about 8 percent, the study found. Data from countries analyzed in this study were primarily from developed countries, Paulson said. The reasons for the national differences are not known, but Paulson theorizes that the U.S. has comparatively stricter family-leave policies in the workplace than in some European countries. Also, he said, "In the U.S., there's a known problem with men seeking help for depression and a documented stigma with mental health." The new analysis does have limitations, however. Because it drew from a large pool of studies that had different methodologies, and different ways of reporting and measuring depression, the authors cannot say what the prevalence of depression is in any specific time frame. Also, the larger analysis may include biases inherent in the studies it put together. Despite these drawbacks, the findings do clearly point to a need for greater depression screening efforts for expecting fathers, the study authors wrote. The connection between parents' depression suggests that depression in one parent should prompt clinical attention to the other, the authors wrote. "Likewise, prevention and intervention efforts for depression in parents might be focused on the couple and family rather than the individual," the study said. The study did not compare depression rates across men of various age groups but did not have any teen fathers, Paulson said. "Baby blues" in either parent is a normal feeling for a few weeks, but postpartum depression lasts longer and brings more severe symptoms. Sadness, anxiety and feelings of worthlessness are some of the signs of postpartum depression in men. Some observations have noted that men experience it more in the form of anger, irritability and withdrawal than in sadness, which women often report. But there's not enough research to conclude that these differences usually exist between depressed mothers and fathers, Paulson said. The first step in addressing the problem is to get both spouses and physicians to recognize that new and expecting fathers are at increased risk for depression, and to help them get appropriate treatment, Paulson said. This may include psychotherapy and medication. "Actually getting fathers to the point where they're talking to a doctor about it is the most difficult challenge," he said. "Once fathers are in the appointment, I think they have a much better chance of getting effective help for depression." Matthew ended therapy after a year because of financial reasons, but he already had begun to recover at that point. He also exercised five days a week, volunteered at his church and forced himself to make social plans. He said his negative feelings do come back now and then, and he's terrified of depression returning if he and his wife were to have another child. But one valuable skill he credits to therapy is the confidence he's gained in being a father. "That helped immensely -- just thinking that yes, I do have the skills, spending more time with my daughter alone, realizing that I can do this without falling apart, without ruining her life," he said. There are fewer resources available for postpartum depression in men than women because it is a less-recognized problem. Check out postpartummen.com for an online forum and more resources. For women, try Postpartum Support International.